University President Joanne Glasser sent an e-mail to the Bradley community in early December informing everyone she had just undergone surgery as part of her breast cancer treatment. After surgery, she underwent six weeks of radiation treatment, finishing in the middle of February. Glasser said she thought it was important to share the diagnosis with the Bradley community because of the promise she made to students to be accessible and visible. She wants her struggle with cancer to act as a lesson for others, and she wants to relay the importance of early detection and yearly mammograms. Just before Thanksgiving Break, freshman Joel Wilson was found dead in his Geisert Hall room. The death was an apparent suicide. Executive Director for the Center of Residential Living and Leadership Nathan Thomas told the Scout in December people were “stunned” to hear the news, but said he thought Residential Life Staff responded to the tragedy well. However, Thomas said there is not way to train for a tragedy such as a suicide. The large turnout of young voters in November’s elections helped Pres. Barack Obama to a historic victory. Obama won a majority of the youth vote in 41 states, according to CNN exit polls, and political science professor Craig Curtis told the Scout in November the youth vote helped him win key battleground states, such as North Carolina. Obama also won Indiana, a state that hasn’t gone blue since 1964, because of the large turnout of young voters. “They always say that a lot of young people are going to come out, and then they don’t come out, [but] they actually turned out and voted,” said Zach Sievers, the Bradley chapter coordinator for Students for Barack Obama. Sigma Nu fraternity called University Police on Sept. 20 after Second District City Council Barbara Van Auken allegedly trespassed at the house. Earlier in the night, police responded to two noise complaints at the house. Soon after, Van Auken and friends Andrew Rand and Sid Ruckreigel walked onto the front lawn at the fraternity house to demand the members stop making noise. Van Auken then contacted university administrators and the Peoria Police Department, who sent officers to the scene. The night ended with a ticket for a noise violation to Caleb Matheny, the former fraternity president. In March, Sigma Nu filed a lawsuit against Van Auken, Rand, Ruckreigel and the city of Peoria. “The harassment has been going on between the neighborhood and the greek community, and it seems Sigma Nu, probably because of its location, has been mostly targeted,” Matheny told the Scout Sept. 27. The Markin Family Student Recreation Center made its debut on campus in late October, and satisfied many students’ workout needs. The cost of the facility was $28 million, and it includes an indoor track, a climbing wall, four basketball courts and increased cardio and weight training equipment. More students have attended fitness classes in the Markin Center compared to the past, and the new facility has brought many student jobs to campus. Thirty-nine student-athletes were ticketed at a party allegedly hosted by the men’s cross country team in November. The party was busted by Operation Campus/TAP after state troopers witnessed what they believed to be minors drinking inside the house. Student-athletes who were ticketed did community service and some were suspended from games. 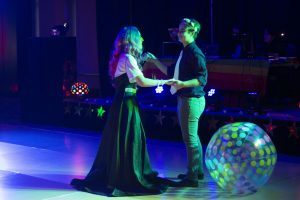 A total of 65 tickets were issued at the party, nine of which were issued to students older than the age of 21, which isn’t something usually done by Campus/TAP. Students have felt the effect of a faltering economy in their searches for jobs after graduation. Many companies have issued hiring freezes and layoffs, while others are taking “wait-and-see” approaches, Director of the Smith Career Center Jane Linnenburger told the Scout in February. “Some students have learned that their second interviews have been canceled, others have been told that everything is on hold for a while,” she said. Many employers who attended the Spring Job and Internship Fair in February were delaying hiring of full-time employees. Caterpillar Inc. cut 20,000 jobs in January, a move that affected many students who planned on interning or working full-time during the summer. This year, more students have looked to graduate school to wait out the job market slump. Students woke up to 164 e-mails on April 7. What started out as a message to get students to vote for the Red Ticket in the Student Body Officer elections ended with students setting up lunch dates and discussing mascots for Bradley. Because of the spam, administrators waited two days to release the results of the elections. 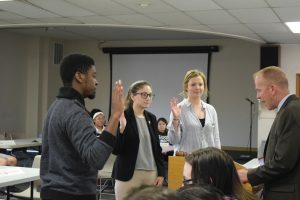 “We wanted to make sure the results of the election were still valid, and we are confident that no candidate had knowledge of this e-mail,” Director of Student Activities Michelle Whited told the Scout in April. The university was able to discover the student who sent out the initial e-mail, but declined to say who it was or what that person’s punishment was, if any. Former Bradley student Ali al-Marri was indicted in February for allegedly helping al-Qaida in 2001. Al-Marri was pursuing a masters degree in computer science when he was arrested in his West Peoria apartment. “The indictment alleges that Ali al-Marri provided material support to al-Qaida, which has committed horrific terrorist acts against our nation,” said central Illinois district U.S. Attorney Rodger Heaton in a statement in March. Al-Marri pleaded not guilty to a Peoria courtroom on March 23. The trial will likely take place at the end of the year, U.S. District Judge Michael Mihm said. Al-Marri is being held in the federal prison in Pekin while his trial is conducted in the federal court house in Peoria. The university struggled all year to meet the goal set for the incoming freshmen class. Administrators blamed the poor economy for having tuition deposits lower than normal. “A lot of people losing their jobs are … the ones who would send their kids to private school,” Vice President for Student Affairs Alan Galsky told the Scout in February. Galsky said the university planned to approach the admissions process differently this year, before the economy began its downward spiral. Students were admitted earlier, and the goal of that was to get qualified students to come to Bradley. As of April 20, Bradley had only 762 deposits, 300 short of the goal of 1,080.